The government’s decision to not permit civilian traffic on the 300-km Jammu-Srinagar national highway on Wednesdays and Saturdays attracted resistance from unusual quarters. The Indian Army deployed in the Valley was not pleased — and this gives the game away. While the Army made no formal comment, its unhappiness was evident from press reports. The media, citing military sources in the Valley, has suggested that the Army had not even been consulted in arriving at the decision. And on the security side, the Army is currently the most important stakeholder in Kashmir, especially since south Kashmir is in flames, thanks to policies which are not just shortsighted but dangerously misconceived. A former Army chief, Gen. V.P. Malik (Retd), under whose command the Kargil intrusion by Pakistan was beaten back, was forthright in his language when he criticised the idea of restricting the use of the highway for civilians. Recently, when announcing that the highway — which is the lifeline for the people of the Kashmir Valley — will not be open to civilians on two days of the week, it was officially stated that this was necessary from the security point of view since preparations had to be made for the Lok Sabha elections, during which period, it was said, more troops will be needed. But this is surely someone’s imagination running riot. Many elections have been held in Kashmir and the need to keep civilians off the highway was never felt. Besides, even the Army does not think of it as necessary. It wants to be able to use the road connecting Jammu to Srinagar on all days of the week if needed. It has no problems if the local people use it too. That is how it has always been. So let’s be clear: The main security guys — the Indian Army — don’t need the people to be kept off the road. Who does then? The government, who else? And, why? Because of the election, quite clearly. This is not a complex theorem from Euclid’s geometry. It is a straightforward deduction from the government’s general conduct. The present ruling party at the Centre, its fount of inspiration, the RSS, and the government of the BJP, are all about shouting from the rooftops that they act “strong” when it comes to national security. Keeping the people of Kashmir off the road which is their lifeline is, for a party like the BJP, a way to inform its core constituency across the country in the election season that it is capable of acting tough with “anti-national” elements, unlike its political opponents, whom it seeks to represent as being hand-in-glove with Pakistan and with terrorists. From the BJP’s perspective, the people of Kashmir appear to qualify just so perfectly for the “terror” tag because, on account of the Centre’s adamant refusal to bring politics into play (so unlike the Vajpayee and the Manmohan Singh governments), some of their youngsters are running an insurgent campaign. The other — and perhaps no less significant — reason is that these people are of a religious faith with which the thinking of the saffron group has never been in accord, not to put too fine a point on it. In short, those who matter in Delhi, and their bailiffs in the Valley, are playing with fire. To make Kashmir an issue in the national poll campaign by punishing the ordinary Kashmiri for no crime committed is to play fast and loose with the unity of the country and its integrity. And for what? To grab a few extra votes! But there are no surprises here. 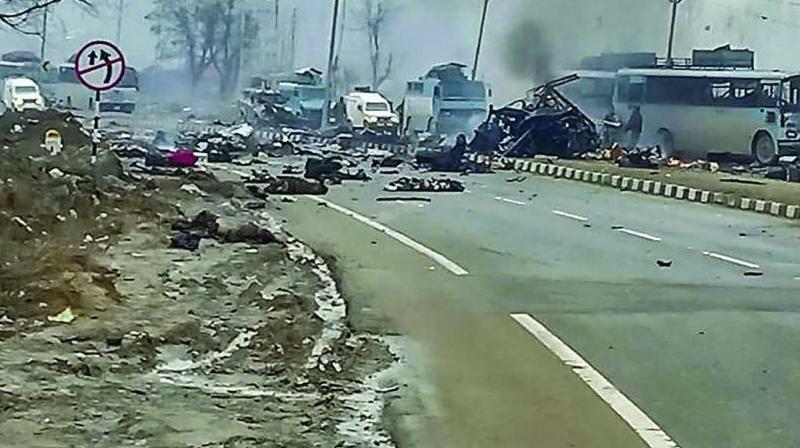 After Pulwama, we may recall, Kashmiri students pursuing their studies in other states and Kashmiri traders outside the Valley were demonised as terrorists and set upon by communal goon squads, with BJP-run state governments acting dumb for the most part. In BJP-controlled Jammu, a curfew had to be imposed to protect the Kashmiri people living in the largest city of their own state. It is like the Punjabi being set upon in Chandigarh or the Tamil being hounded in Chennai. It’s quite unbelievable. The people of Kashmir were beaten up so that the BJP and its government may have the chance to give the impression of being tough on terror. Not letting the people of Kashmir use the national highway that links to their own major city is a part of the same syndrome. None of this may have happened if this was not the election season. In her recent book published last December (Paradise At War, Aleph, New Delhi, 2018) which offers striking details of attempts at peacemaking in Kashmir through the administrations of Prime Ministers P.V. Narasimha Rao, Atal Behari Vajpayee and Manmohan Singh, Radha Kumar — who was among the three interlocutors for Kashmir appointed by Dr Singh’s government — informs us of the troubling complexities that Vajpayee had to cut through in order to pursue peace. Indeed, for him — it seems to this writer — going to war may have been the easier option, considering the ideological school he came from. Looking back, Vajpayee seemed acutely conscious that he must have the people of the Valley on his side, rather than let them be trapped by extremist ideologies. He kept promoting peace and talking to all elements in Kashmir as well as with the Pakistanis in spite of such grave provocations as the Kargil war, the burning of the J&K legislature by Pakistani terrorists, and the attack on our Parliament. None of this was seen as a sign of weakness either in India — including Kashmir — or in Pakistan. As Radha Kumar reminds us, “To further underline the government’s commitment to peace, Vajpayee led an all-party delegation to Pahalgam, with George Fernandes and Congress president Sonia Gandhi”. The then PM did not suffer from an insecurity or inferiority complex, and had no hesitation in taking the Congress leader on board in order to signify national resolve. Not only did the Vajpayee government open talks with the Hurriyat leadership but also with the most powerful military commander of Hizbul Mujahideen, Majid Dar. Then home minister and deputy PM L.K. Advani held two rounds of talks with the Hurriyat top brass in New Delhi in the early part of 2003. Of this experience he said in his book My Country, My Life, “I found the Hurriyat leaders to be genuine, earnest and to some extent, open-minded in their interactions with me”. (Quoted in Radha Kumar, op cit). In contrast, today we have the so-called “surgical strike”, which has not deterred terrorism; we have Balakot as retaliation for Pulwama (whose efficacy is a matter of raging debate) as far as Pakistan is concerned, and restraining civilians from accessing a highway that goes past their homes in the case of the people of the Kashmir Valley.